Along the western coast of Central America, the Cocos plate subducts towards the east beneath the Caribbean plate at the Middle America Trench. Convergence rates vary between 72-81 mm/yr, decreasing towards the north. This subduction results in relatively high rates of seismicity and a chain of numerous active volcanoes; intermediate-focus earthquakes occur within the subducted Cocos plate to depths of nearly 300 km. 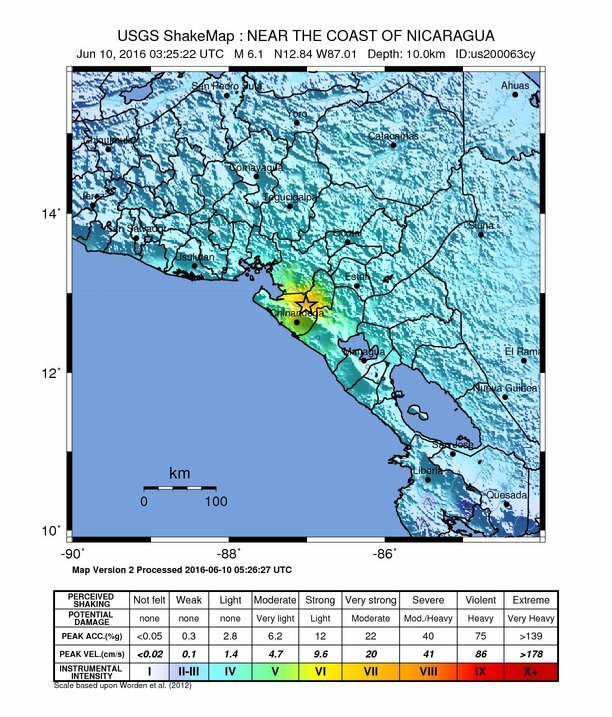 Since 1900, there have been many moderately sized intermediate-depth earthquakes in this region, including the September 7, 1915 M7.4 El Salvador and the October 5, 1950 M7.8 Costa Rica events. 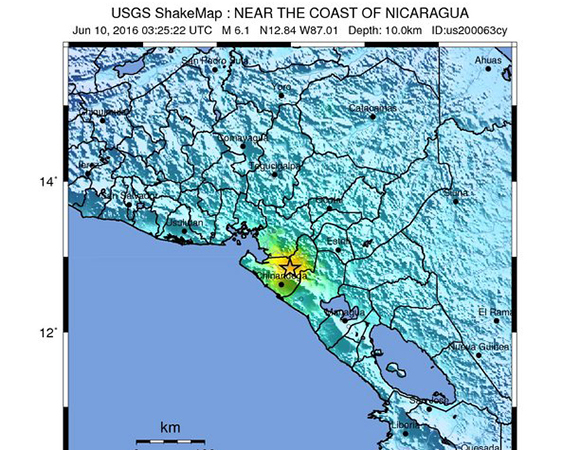 In response to the Mw6.1 earthquake 17km E of Puerto Morazán, Nicaragua on 2016-06-10 at 03:25:22 (UTC), UNAVCO downloaded high-rate one-sample-per-second (1-sps or 1 Hz) data from nearby GPS stations for a 7-day period around the event (day of event ± 3 days). A map of downloaded GPS stations is shown in Figure 2. 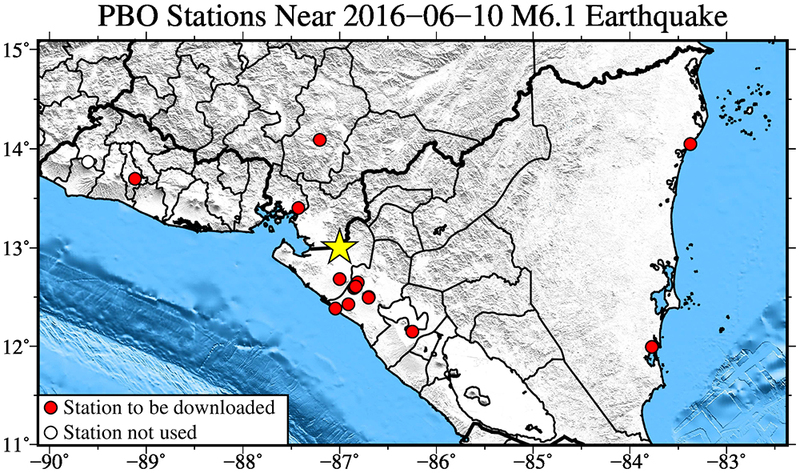 (Note: data from newly built stations POLI and ELMA are available but these stations are not shown on map.) 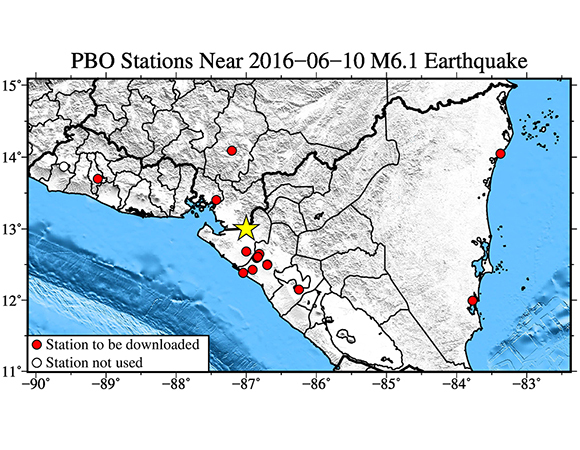 These data are available from ftp://data-out.unavco.org/pub/highrate.